With their import quotas, foreign film blackouts, and other methods of market management, SARFT and the PRC government have made it abundantly clear that protection of local films and producers is a major Chinese policy goal. Since Chinese protectionism is unlikely to go away, U.S. and other foreign producers who seek to participate in China’s booming film business will need to start engaging more with local Chinese companies. There are several thousand licensed production companies in China (more than 1,500 in Beijing alone), so outsiders need systematic ways to narrow their lists of potential collaborators down to manageable size. One such method is to measure companies by their respective market shares. That’s my purpose here. 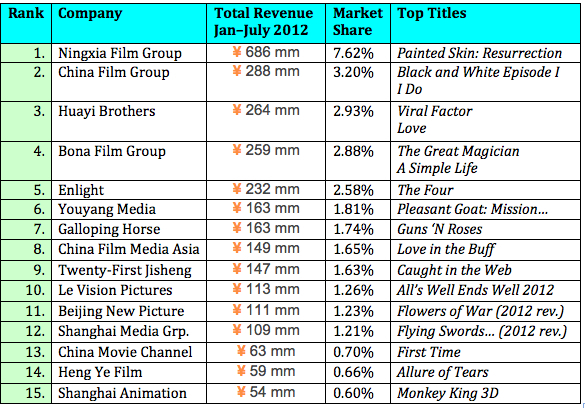 I’ve listed below China’s top production companies by their market share during the first 7 months of 2012. In calculating market share I’ve attributed each Chinese language film to a single production company, even though in some cases there were as many as 15 production companies credited on a single film. In such cases I’ve attributed credit for the film only to the company that received the first position credit. Co-productions with foreign companies are attributed to the mainland Chinese partner. Ningxia Film Group is the official government owned production company of Ningxia Autonomous Region, a tiny northern Chinese province that borders Inner Mongolia. The company landed at the top of this list by virtue of a single film, Painted Skin: The Resurrection, the only film it has ever produced. Ningxia’s President, Hong Yangtao explained that he had only one chance at making a movie: “We shot this film to survive.” His strategy for producing and launching Painted Skin 2 has resulted in mainland China’s most successful film ever, so it’s very possible that Ningxia may avoid the fate of becoming a one-hit wonder. With all of its financial strength, distribution clout, and government influence, it’s surprising that China Film Group’s production division has managed only a 3 percent share of its home market this year, far less than any one of the Hollywood studios have captured in China. The Beijing-based company is a government-owned behemoth that is far more influential in the distribution sphere, where it has played a role in releasing 19 of the top 20 grossing films of 2012. Under its Chairman Han Sanping, CFG is preparing for an upcoming IPO. China’s most powerful independent (i.e., non state-owned) entertainment conglomerate, Beijing-based Huayi Brothers is a diversified company engaged in film and TV production, distribution, theatrical exhibition, and talent management. Huayi Brothers trades on the Shenzhen stock exchange at a market capitalization of US $1.5 billion. The company’s Wang Brothers are skilled at attracting top directors, and they consistently rank among China’s market share leaders. If any Chinese company can challenge Hollywood’s studios for market dominance in China, Huayi Brothers is certainly a top contender. Like Huayi Brothers, Beijing based Bona Film Group is also an independent, publicly traded company engaged in both production and distribution of films. Trading on the US NASDAQ exchange, Bona’s current market capitalization is US $345 million. Under President Yu Dong the company has been a reliable supplier of blockbuster hits in recent years, and usually captures at least a 10 percent share of the domestic market. Bona is one of the more internationally-oriented Chinese companies, with interests in Hong Kong and the United States, and is now 20 percent owned by News Corp. Look to Bona to be one of the next producers of a crossover hit that breaks out internationally. Under CEO Wang Changtian, Enlight Media rarely mis-fires in its production and distribution of feature films. Squarely focused on the action and romance genres, Enlight usually places several films in China’s top 20 grossers, and currently has in release the country’s fourth highest-grossing Chinese language film, The Four. Enlight is also a major player in China’s TV series production and distribution businesses. Under the leadership of its CEO Wang Changtian, the publicly traded, Beijing-based company has achieved a market capitalization of nearly US $1 billion. Companies that didn’t make the top 15 ranking above but that are worthy of mention include Shanghai Toonmax, Stellar Pictures, Xiaoxiang Film Group, Henan Film Studios, DMG Entertainment, and Dadi Films. Too many production companies are competing in China for scarce resources—and for even scarcer quality scripts. If the PRC’s film regulators are serious about making their domestic industry more competitive, they should focus less on protectionist measures and more on encouraging consolidation and cooperation among the industry’s disparate players. This entry was posted in Analysis, Box Office Reports, General News and tagged China consultant, China Film Biz, China film expert, China Film Group, China Movie Channel, Chinese movie expert, Enlight Media, Galloping Horse, Han Sanping, Hong Yangtao, Huayi Brothers, Le Vision Pictures, Ningxia Film Group, Rob Cain, Robert Cain, Shanghai Media Group, Yu Dong by chinafilmbiz. Bookmark the permalink. Terrific Robert absolutely terrific … Robert N Walker, (New Zealand). Robert, you are the man. I always get value from your postings. If I can ever be of service let me know. Nansun, thanks for your update. Hello Robert, I have a question… The total market share of the top 15 production companies is only 31.7%. Does it mean that other “several thousand” licensed production companies share 68.3%? Thanks! The other 68.3 percent went almost entirely to U.S.-made films. Hello Robert, sorry I have another question about this… When U.S. films enter Chinese market, US companies have to split the profits with their Chinese partners right? So the 68.3% means the profits left to US companies? Or the Box Office gross without splitting? For the market share in the chart, does the 31.7% market share include profits those Chinese companies got from US films? Or only Chinese films? Thank you very much! Good question! The market share figures refer to the share of gross box office revenue, that is, ticket sales.